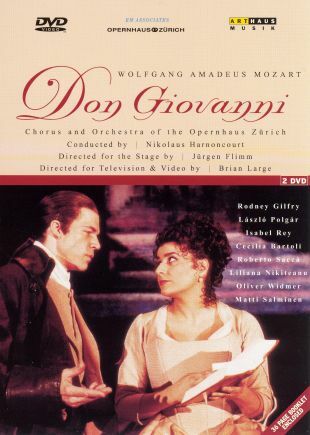 Recorded at the Opernhaus Zurich in 2001, this release from Arthaus Musik features a live performance of Wolfgang Amadeus Mozart's Don Giovanni. Along with Rodney Gilfry in the title role, the cast includes Laszlo Polgar as Leporello and Isabel Rey as Donna Anna. The Orchestra of the Opernhaus Zurich provides the music under conductor Nickolaus Harnoncourt.